Single Ply Systems deliver excellent thermal insulation which reduces the carbon footprint while delivering high quality protection. Our experienced team can explain the different systems and advise on the best solution for your roof. We have used this system on various buildings including hospitals and schools. Single ply continues to be one of the most popular systems in the UK, particularly in the new build market. Its neat finishes make it particularly popular with Architects, as it can also be used to mimic standing seam roofs without the structural weight of a typical standing seam roof. Although single ply has its advantages, it has certain drawbacks that need to be considered closely before choosing your system. There are pros and cons of any waterproofing system, and M&J can provide unbiased opinion of each and every system, allowing you to get the right system for your roof. 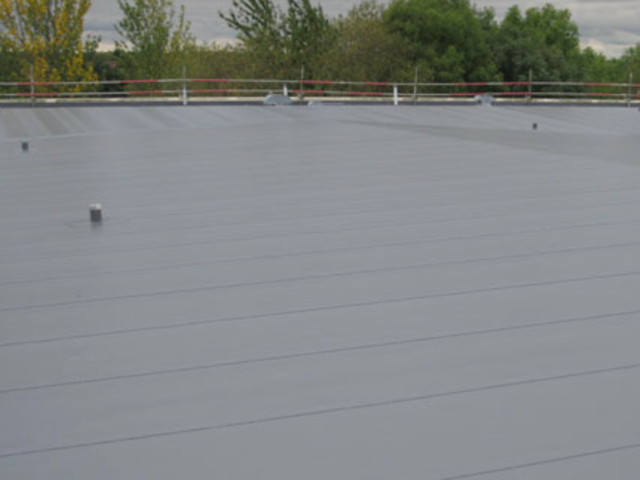 EPDM is a synthetic rubber roofing system used world wide. Although very popular in the USA, it is not as popular in the UK. As with single ply's, it has many benefits and limitations and care should be taken before specifying any particular product.